Alright, I’ll admit it, I’m paranoid. Too many loud noises, too many sneak attacks when I was a kid walking home from school, whatever the reason, there’s always a bit of that itchy little feeling that someone’s out to get me. Having the default old-school nerdy interests in conspiracy theories and cyber security doesn’t help the matter either. Thanks Slashdot. Ahh but where I itch, Google has the salve! 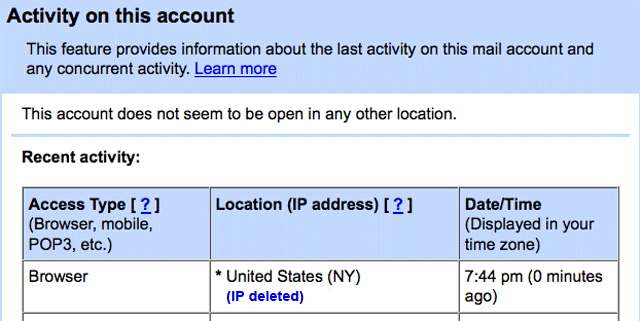 I had no idea until today that Gmail has a neat little feature that shows you recent activity on your account. IP, location, type, time. Just the sort of thing a guy needs to quiet the concerns that my parents have been feigning internet-ineptitude and have been monitoring the extreme levels of cussing fund in a typical email exchange.